You have to eat and Rotarians also eat, so look for them everywhere. 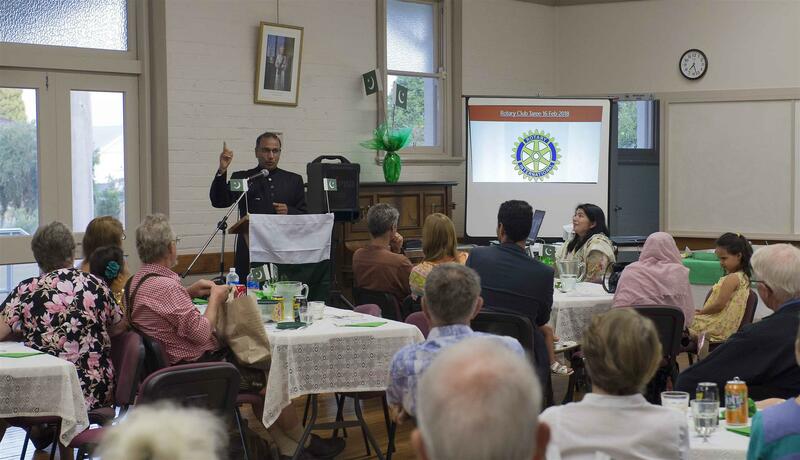 We have been to Rotary on the Gold Coast, Taree (pictured), Numurkah, Shepparton, Eaglehawk, Castlemaine, Ballarat South and West, Warrnambool, Mount Gambier, Bordertown, Smithton, Launceston, Devonport, Scottsdale in Tasmania and two in Perth. We have also been in some exotic locations: Auckland and Christchurch in New Zealand, Ubud in Bali, Beijing and Shanghai and Warsaw. We have had breakfasts, lunches and dinners and been entertained as well. One Rotary club held the final of their youth public speaking, another had a guest speaker with a disability who performs on his custom guitar and was about to go to the USA with his carer and friends. We have learnt about fencing, not the post and wire type, how a club raises an awesome amount of money to help more than 350 children with heart disease. The Ubud club has only a few members, but when projects are due, an influx of Rotarians from Brisbane and California arrive to help. In NZ the Auckland club held a party for us (it was their birthday) and their guest speaker was past PM David Lange at his last public appearance!